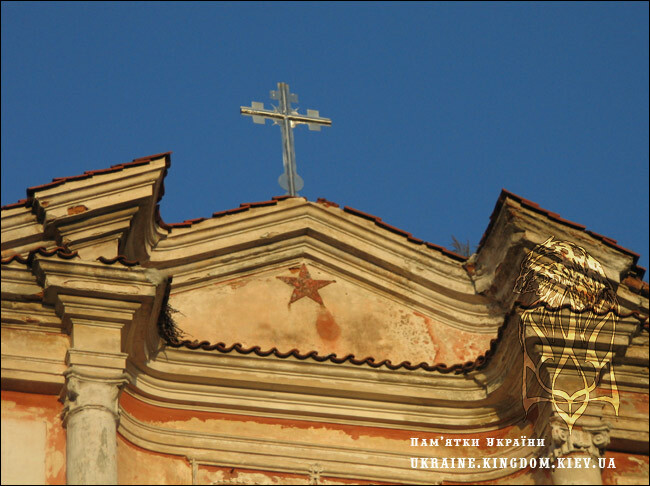 Three years ago I was searching for various books about historical places in Ukraine like ancient castles and monasteries in one of the libraries in Kyiv. 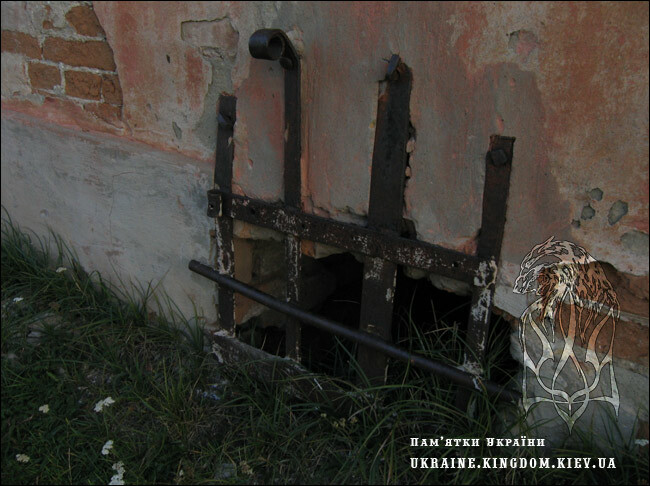 At that time I found a list of all the castles in Ukraine. And I wrote down a headline in my writing-book – “The castles I do not know”. A few castles-fortresses from the Crimea, one from Zaporizhia and one from Dnipropetrovsk and one settlement with the Russian name Ivaniv in the Vinnitza Region got into my list. Three villages were located nearby but there were no data even in Internet about that settlement. Three years ago I did not believe that it was possible to go there. I had no chances to go by car belonged to my friends. I was tired of waiting for a chance. On October, 1 I decided to go there by myself. My day started at 06:00 a.m. and ended at midnight. I thank God for support and warm sunny weather. On the right side is lithograph of Napoleon Orda. He visited this place also! My dream became true on October, 1 2007! 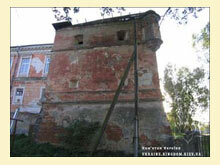 The first time Yaniv is mentioned during a description of the Vinnitza castle in 1552 as the Yanivska village. 16 houses had been here. At that time that land belonged to Mr. Oxakov. In 1578 king Stephan Batory gives Hnevosh Stryzhevsky the right to found the city and estate of his Yaniv Bratslavsky province. Thus Yaniv got the Magdeburg right (a status of the city). Official document gave the right to hold trade-fairs, bazaars on Friday every week. Yaniv was also destroyed. 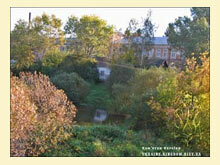 Yaniv was seized by Kholonevsky at the end of 17th century. Kholonevsky were relatives of Polish king Yan Sobesky maternally. The progenitor was Petro Myshytza (Myshka). In 1394 he received the Kholoneva village from king Kazymyr. That is why that generation bears this name. In the first half of the 18th century Yaniv’s heir became Jan Myshka-Kholonevsky. His son Adam also received it. His wife was Solomia from the Kantsky’s family. In the middle of the 18th century new castle was built. 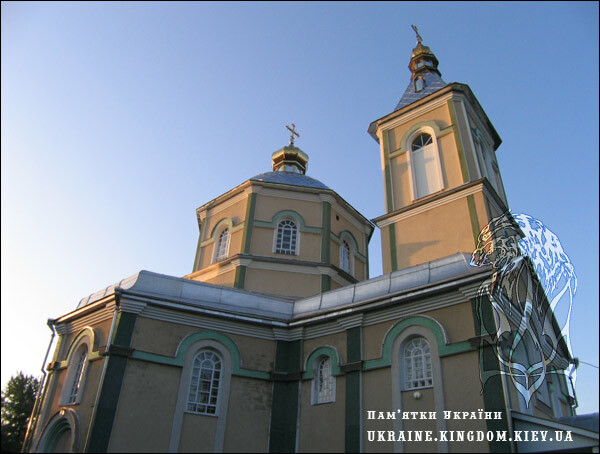 In 1780 Adam’s wife Solomia founded a Catholic church and monastery of Bernardyny in Yaniv. Andjey Kholonevsky (1872-1950) was the last owner of Yanov. In 1790 Polish king Stanislav August visited Yaniv. 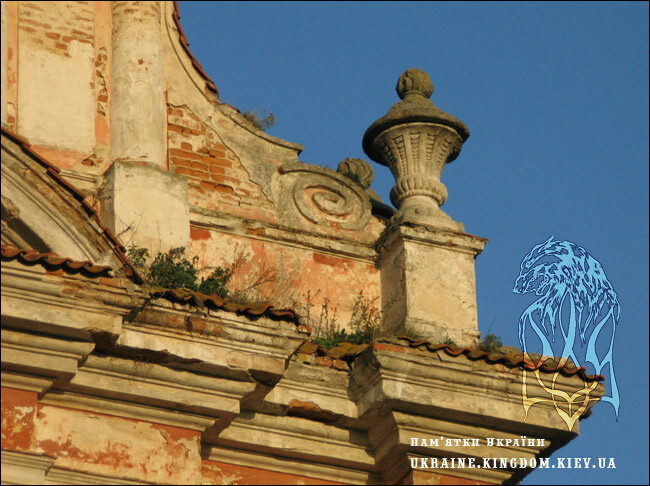 At the end of 18th century Yaniv had two central streets, strip malls and houses of craftspeople nearby the castle. There was a town council with high tower with a clock in the city. Nearby the town council wooden church could be noticed. The town council had been as a bazaar later. The town council was destroyed during the World War Second in 1942. Books had been published for Old Believers secretly in the printing office in Yaniv. Initiator was a merchant from Kyiv Constantine Kolichev. We can judge about Yaniv from the following data: 2,000 residents, altogether 401 houses, 2 walled-up churches, 4 mills, 2 brewery works, 44 shops. 26 trade fairs had been held there. Narrow-gage railroad had appeared across the lands of earl and it became a significant event in the history of city. The station also was built on the land belonged to Kholonevsky. The earl allowed to build the station on his land under conditions the station would be named in his honor. 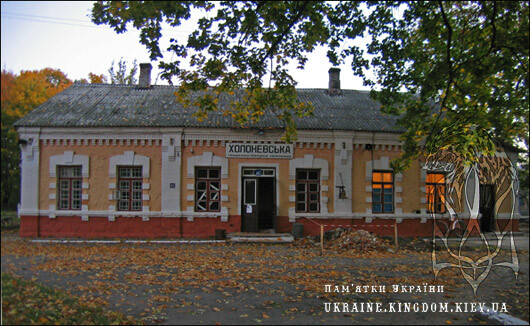 Since those times railroad station located in Ivaniv village is called Kholonevska. In 1946 Yaniv was renamed Ivaniv. In 1936 new railroad Kyiv – Kamyanetz-Podilsky had been going through Yaniv. As a result, when you go from the capital into the city of “flower on the stone”, and when we see dreams at midnight, the train is going through the village where the castle is situated which is unknown for travelers. On October, 1 2007 my dream became true! 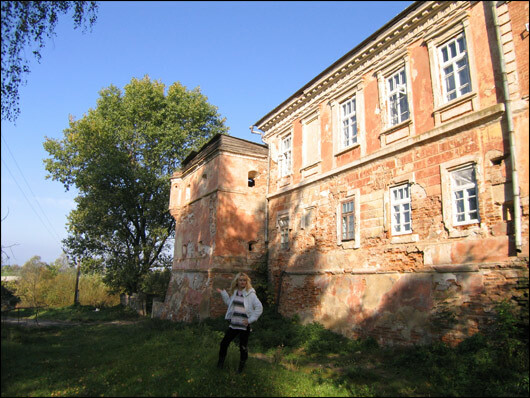 The defensive situation of the Podol territory made the Yanov’s owner Hnevosh Stryzhevsky to build a castle in 1596. The permanent attacks of Crimean Tatars made authorities to build up a big defensive complex. The substitution of weapon for fire-arms influenced on conditions for construction and architecture. The Yaniv castle was built up like a bastion, which had been popular during those times in the Europe. The castle was built on the plain, surrounded by banks and ditches for safety. The yard surrounded by walls of housing and utility rooms had 7 meters high over the surrounding. 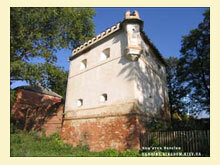 The castle situated in Yaniv has rectangular two-pier towers made of red brick with a use of stone. You will pay attention to good observation bay windows. It has modeled roses-windo. The main entrance was on the southern side. The palace was on the opposite side. A big chapel with 12 gothic windows was located in the north-southern part. There were 2 not large loopholes which were situated on each side of tower from below. The south-western tower has been preserved well. There was an observation post. In the second half of the 18th century its holes were divided by conical arches. 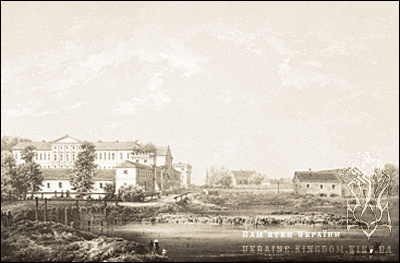 In the first half of the 18th century the Yanovsky castle was very deserved and could not be restored. Thus the old Palace was destroyed and the new one was constructed. The date of commencement and completion of new palace construction is unknown. But the king Stanislav August Kholonevski was received already in the new palace on November, 20 1781. 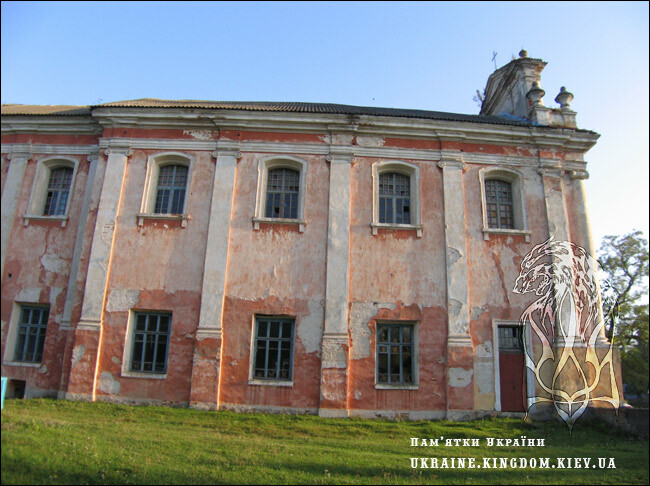 The residence belonged to Adam Kholonevsky had both features of late baroque and classicism. New palace was two-storied building but its central part was three-storied one. Under the palace big two-storied cellars were situated. The walls are strong in cellars. The height of the palace was 27 meters. Gypsum bas-relief on the triangular pediment, among modeling quivers and sabers. The palace had yellow color. The building outwalls had width 1,80 meters. The interior walls had width at least 1 meter. There are still wrought bars walled into the wall on the windows. All the rooms were combined. While going along the palace, one could hear the ghosts in the castle built in Middle Ages, labyrinth had many corridors of different levels and corners. A parquet floor was laid there. The steps were preserved the same since those times, wood is damaged a little. The porters of the generation hanged in the corridor. The right side of the palace was applied for summer residence of masters. The dwelling part took only two large rooms: sitting room and bedroom. 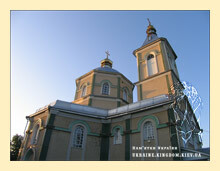 Priest Stanislav Kholonevsky visited it often. By his request unknown artist covered the northern wall of bedroom with fresco with a sight of St. Petro, the Bernyny’s columns and the Pope’s court. Relatives called this room “Vatican”. The walls had bright wall-papers, two mirrors hanged from cellar to the floor, which were brought some time ago by luge by Ms. Solomya from Paris were in the sitting-room. Also big classic fireplace paved with white marble stood near the oven paved with tile. 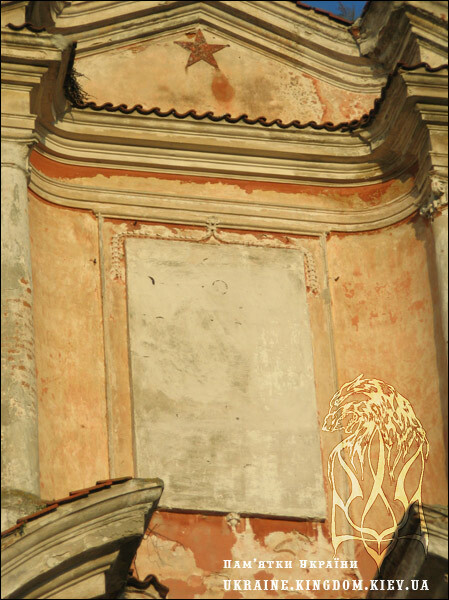 The clock made in the 17th century stood on the fireplace in the gold-plated bronze mounting. Almost gothic legend is concerned with that clock. They say the clock stopped each time when somebody from the Kholonevsky’s family died. The buffet room and dining-room equipped with furniture made in the 18th century were in the sitting-room. Three windows on the west were walled up in the dining-room. Instead of it two large pictures with family-tree hanged there. There collection of European china and silver had been there. The walls of dinning-room were upholstered with a coarse silk. The drawing-room and bathroom were located on the ground floor. It had different size and form. 25 family portraits hanged in the portrait hall of the palace. Also old furniture stood there. The dancing room was near the portrait room. There the walls had ivory color. There were 4 windows on the eastern side and four windows on the western side, parquet floor with a big bichromatic star in the middle (light and dark color which transformed into the black color, decorated with mosaic). The crystal chandelier with a few tens of candles hanged on the cellar. The wall had four pairs of columns. Also two round ovens stood there. The mirrors hanged between windows. The furniture had a style of Ludovic the Fifth. There was also Chinese yellow hall in the palace. “The domestic church” was located on the north. Stanislav Kholonevsky re-constructed it. Earlier it had been a bedroom. 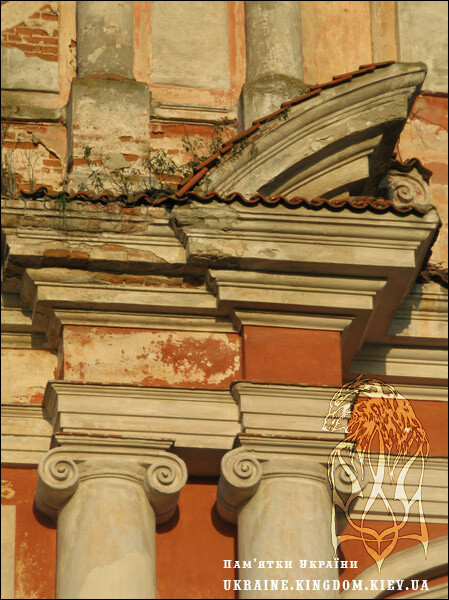 There one quarter was separated by columns of Tuscan order covered with marble. 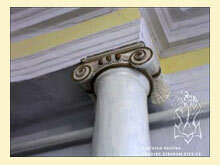 Priest made altar between these columns. The library located in the palace contained about 10,000 volumes. Among the books were even very old and rare specimens. Priest from Kholonevsky’s family brought a lot of philosophical and theological literature, also family archive was there. Unfortunately, the library was lost during the times of revolution on the road to Kamyanetz-Podolsky. A lofty bridge had been through the ditch in front of gates. The kitchen and various houses were near the yard. 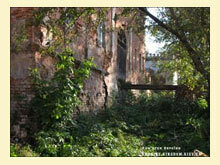 The park and the territory of palace were separated by a wall painted with oil-paint. The wicket with stone steps faced the park. A little rectangular pond was below the park. The fruit and vegetable gardens were behind the pond. 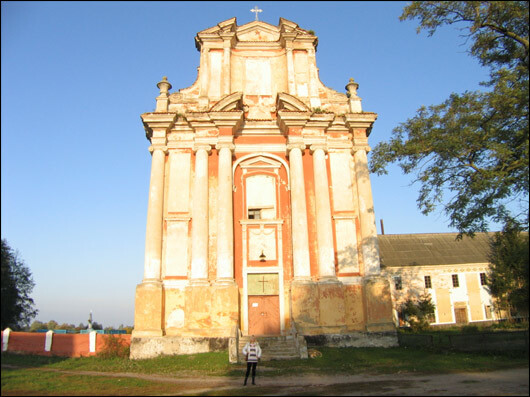 It was possible to go to the Catholic Church of the Neporochne zachatta of Diva Maria (the Immaculate Conception of the Virgin Maria) and the St. Bernardyny monastery. 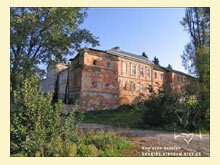 In the 19th century only estate manager lived in the Yanovsky estate. The palace was re-constructed in 1901. 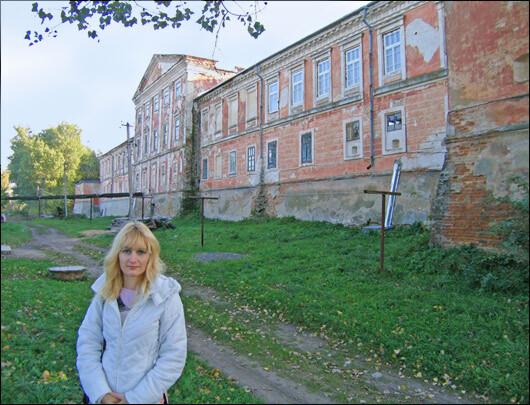 After the Soviet authorities got the power, procuring office was located in the castle in the palace since 1920 but in 3 years it became the Makarenko children colony. Children’s home was founded on that territory almost before a war. Orphans and children of repressive parents lived there. 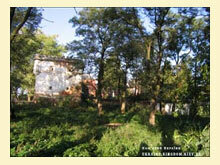 In 1963 children’s home was transformed into the boarding school which has been working nowadays. Now about 120 children live and study there. Their rooms are light and clean. The dancing ball is an assembly hall with modern equipment now. Thanks to headmaster Vira people have good living conditions; reconstruction of palace takes a lot of money. Main facade is repaired, the park facade is planned to be repaired soon. May be, in a few years we will observe the castle reconstructed completely. But in general, this castle can be considered a castle with eastern traditions and it has been preserved best of all among the others built during those years! Early in the morning! Even the moon can be seen! 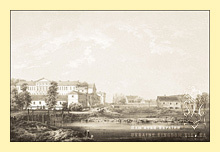 The castle of the Immaculate Conception of the Virgin Maria and the Bernardyny monastery was built at the expense of Solomia Kholonevska in 1780. In 1935 the Catholic Church was shut down. It had no parish. At first there was a club, then sports school was founded here. Still five-point red star can be seen on the facade. Some time ago the interior of Catholic Church resembled interior of one of side chapels of Bazylika of St. Petro in Rome. 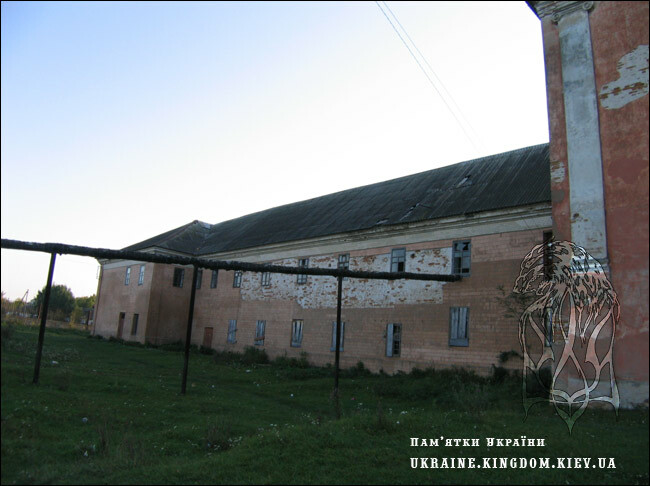 During the Soviet times children’s home with mental defectives was located in the monastery. The castle was again consecrated in 1991. Now local authorities try to take care of temple on their own initiative. “I am not able to do everything by myself”, is written by a priest on the paper with a request to give assistance. It was hanging on the doors of the Catholic Church. 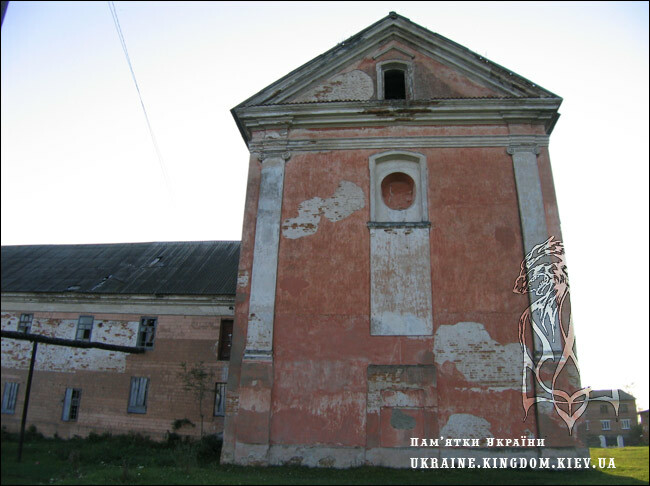 A new church was built in 2005 on the rural cemetery at the place of old St. Mykolay church of the 19th century and ruined church in 1935.